Originator of the beastly trap classic “Harlem Shake,” Baauer (aka Harry Rodrigues) is quickly making a name for himself in the ever-expanding EDM community. An impressive series of releases has put the spotlight on the young Brooklyn-based producer, and his tracks have been spun by the likes of Diplo, Flosstradamus, and Rustie. Ranked in the U.S. top 200 by the DJ List (and #9 in his hometown of New York City), Baauer signed with the LuckyMe family in August of 2012, and made his debut for the label with Dum Dum, a minimal three-track 12-inch that announced his arrival on the scene. The unmistakable saxophone lead of the title track is one of the most well-known sounds in clubs today. The producer’s work seems custom built for DJs, with track lengths reduced to match the quick pace of live performance. Baauer’s resume to date has built up a great amount of anticipation for his first full-length EP. When he’s not in the studio, Baauer plies his trade as one of the finest DJs in the game, and his ability to hype up crowds is unrivaled in the growing trap scene. Though young in age, Baauer has developed the skills and taste of a seasoned veteran, having toured with such big names as Dillon Francis, Araabmuzik, and Kill the Noise, in addition to appearances at Fun Fun Fun Festival and Day of the Dead 2012. 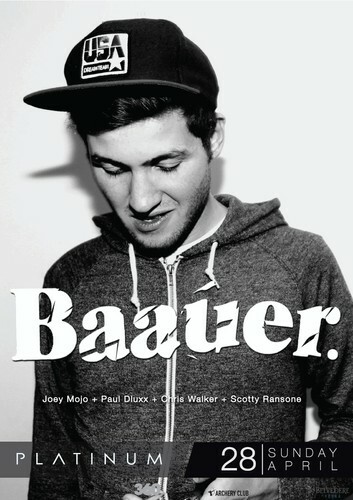 Baauer also traveled to Europe to headline a series of gigs in the fall of 2012. The high demand for his trap skills led to his providing a remix for Nero’s “Won’t You (Be There)” on MTA Records. Mark our words: Keep an eye on Baauer. We at DJZ predict you’ll be hearing his name much more in the months ahead.